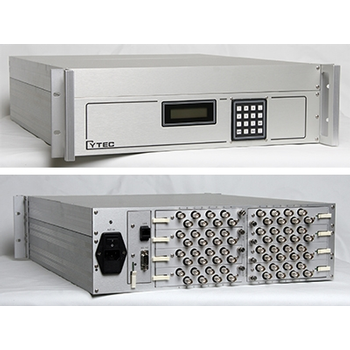 VDM Series - Cytec Corp.
Cytec's VDM Series of video and RF switching systems are based on a solid state switch fabric and are available in non-blocking, full fan-out configurations of 8x8 to 32x32, with a small signal bandpass of 400MHz. Input and output buffers can be modified for different impedance or signal levels. Both the switch modules and control modules are modular for ease of expansion and low MTTR. Start with an 8x8 matrix and expand to a 32x32 simply by adding additional input and output modules.